Welcome to our live coverage of the 2016 AUSC Zone 5 Games women’s clash between South Africa and Zimbabwe at the 11 de November Stadium on Wednesday! Zimbabwe lost both their opening games 2-0 to Namibia and Angola, while South Africa have a full haul of six points from two games having netted eight goals and conceded none! FULLTIME: An easy win for South Africa in the end as the top the group! 87′ – GOAL! A fouth goal for Linda Matlhalo in a space of 10 minutes. 85′ – GOAL! Matlhalo scores a hat trick in a space of 10′. All three goals identical from the wing. 82′ – GOAL! Matlhalo with a very stubborn attempt and she gets the ball behind the net. 78′ – GOAL! Matlhalo scores SA’s third goal of the match from an easy tap in. 76′ – Second substitution for SA. Jordaan makes ways for Makhurubetshi. 68′ – South Africa make their first substitution. Goalscorer Daweti makes way for another potential scorer in Molweni. 55′ – Ten minutes after the break and South Africa still lead Zimbabwe 2-0. 49′ – Final substitution for Zimbabwe. Sithabile Dhldhlo comes off for Privilege Mupeti. 46′ – Zimbabwe make their second substitution. Barbara Manyenga comes off for Maudy Mafuruse. 46′ – The second half is under way as South Africa lead 2-0! 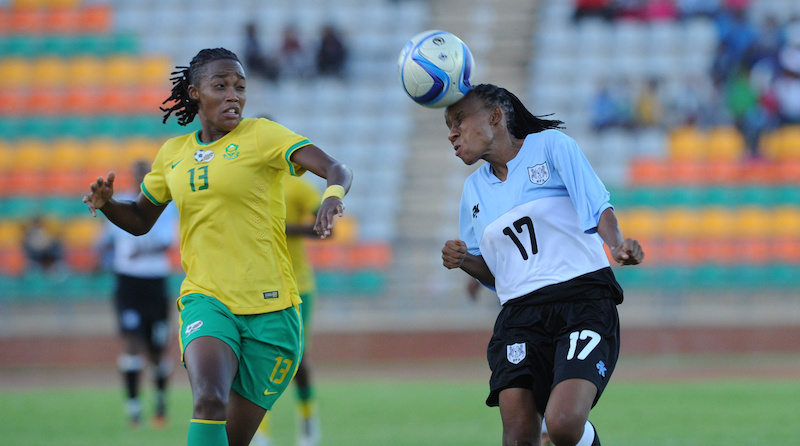 HALFTIME: South Africa lead Zimbabwe 2-0 at the break and are headed for top spot in the pool. In the other match it is 1-1 between Angola and Namibia at the break. 32′ – It is 1-1 in the other match between Angola and Namibia! 31′ – Great save from Mpuru as SA still lead 2-0 against Zimbabwe! 23′ – GOAL! Kaylyn Jordaan catches the keeper off her line and takes South Africa into a two-goal lead! 20′ – Twenty minutes played at 11 de Novembro Stadium. South Africa lead 1-0 Zimbabwe. 17′ – GOAL! South Africa score! Daweti Lelona smashes the ball into the net after a beautiful square ball by Motlhalo! 15′ – It is also 0-0 in the other game between Angola and Namibia. 10′ – Ten minutes played in Luanda. Score still deadlocked at 0-0. 5′ – Zimbabwe forced to make a substitution due to injury. Lincie Mpaya makes way for Dorcas Dhlamini. 1′ – We are under way in Luanda! – The match will kick-off at 15h30 local time, 14h30 GMT!